In August, we discovered that our comfortable storage space in the city of SLO (our central hub housing all gleaning supplies and equipment) was to be sold and we needed to find a new space pronto, before Oct. 1st. We panicked for a brief second. Then we remembered that we are a part of a community that loves all things gleaning. So we shouted our need from the rooftops, the social media mountains and the newsletter outlets. And the most amazing thing happened. Winemaker Pat Muran, President Andy Niner, Winemakers Pat Martinez and Molly Bohlman and GleanSLO Program Manager Jen Miller. 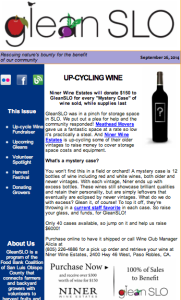 Andy Niner of Niner Wine Estates called and offered to have a Mystery Wine Sale to benefit GleanSLO. He basically gleaned some of his older vintages to make room for newer vintages, sold the Mystery Wine cases (which were a combo of delish older and newer vintages) and gave 100% of the proceeds to GleanSLO to purchase storage space and supplies. 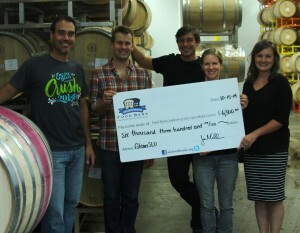 The check totaled $6,300! It was like the gleaning gods were all singing in harmony, shining a little light upon us! We had money for a shed, but no property to put it on. So Andy Niner called his friend over at Meathead Movers. “Hi Aaron. There’s an organization, GleanSLO – from the Food Bank – that needs your help renting storage space. If you can donate a portion of the rent, I’ll fit the bill.” DONE. Meathead Movers donated a space big enough for all of GleanSLO’s equipment with room to grow. This story is worth telling because it reminds us that GleanSLO is a program of the community, for the community, by the community. We recognize that we are blessed to live in a region of such abundance and it is our responsibility to do good with the resources we’ve been given. When the community has a need, we come together to meet the challenge. It doesn’t take much to move mountains! Please help us support our sponsors, Meathead Movers and Niner Wine Estates. Be good to those that keep programs like GleanSLO going strong! This entry was posted in Donations! on 10/28/2014 by gleanslo. 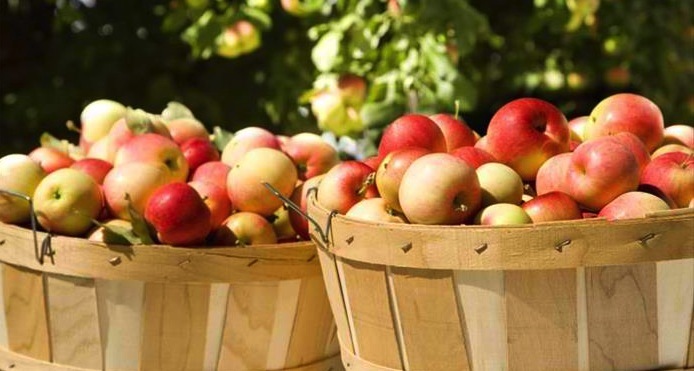 It’s that time of year again for the Annual Apple Harvest Festival 2014!!! 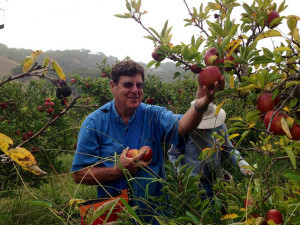 Come out to SLO Creek Farms Organic U-Pick Garden Area Sunday, October 12, 2014 from 1:00pm-4:00pm and get some FREE cider, freshly pressed right before your eyes. All we ask is that you bring your own 1/2 gallon empty jug and help pick some apples off the trees to help donate to the cider press so everyone can enjoy some free cider. First 1/2 gallon is free!!! There will be a tip jar if you would like to contribute to GleanSLO. Also more cider will be available for purchase if 1/2 gallon is not enough for you cider addicts. This Festival is Sponsored by the Food Bank/GleanSLO & SLO Creek Farms. 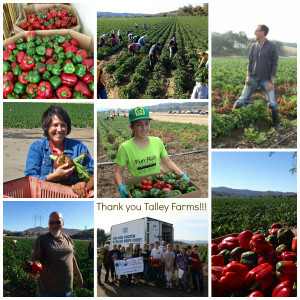 We are celebrating the harvest season, the generosity of the Gable family, and GleanSLO volunteers’ hard work and dedication to feed the hungry and help make this world a better place. 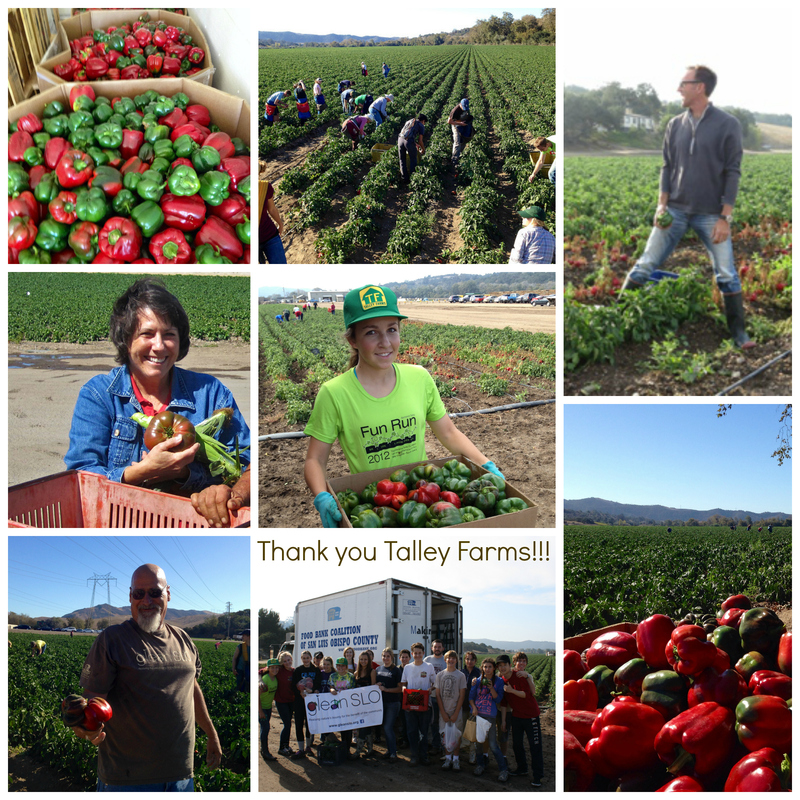 Special thanks to SLO Creek Farms for making this possible!!! We love you guys! We will have Live Music by Green to White, Dancing, BBQing, Raffling, Hooping Contest, Apple Seed Spitting Contest, Apple Pie Baking Contest, Pumpkins Painting, Hayrides and More! All proceeds go to benefit GleanSLO. 14 Total chances to win and all helping a good cause in the meanwhile. Please print your name, phone number, email and your raffle ticket number on the Raffle Form. We will announce the winner; if you are not present we will contact you to collect your prize. *Must pick apples from SLO Creek Farms Orchard the week before and make your own pie crust. Bring your apple pie to the baking table by 12:00pm and leave your name, recipe, and phone number at the registration booth, so we can contact you if you are one of the 3 winners. Recipe will be published in our recipe book for all to see and try, with your name next to it, so make sure it is an original or your own twist to it. Apple Pie Baking Contest will be held around 3:00pm. *1st place winner will receive a free months pass to pick apples, a jug of cider, apple chips, and an apple pie cookie. *2nd place winner will receive a 10 free pounds of apples, plus a jug of or cider, apple chips, and an apple pie cookie. *3rd place winner will receive a jug of our cider, apple chips, and an apple pie cookie. Enter to win!!! The Apple Harvest Art Contest 2014!!! 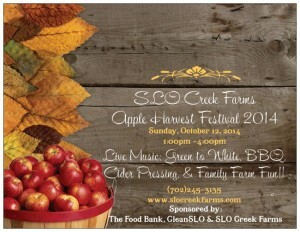 ***Bring your finished pieces to the Apple Harvest Festival at the SLO Creek Farms Organic Herb Garden October 12, 2014 between 10am-12pm. Please put the name of your art piece on the front of you art piece, and also your full name, contact number and email taped to the back of the frame. All levels of artists welcome, Amateur or Professional. So bring your 1/2 gallon empty jug and come celebrate with us. The apples are AMAZINGLY delicious right now and we want you to enjoy them as much as we do. This entry was posted in Uncategorized on 10/08/2014 by gleanslo. Enjoy our September 2014 edition! This entry was posted in Archived Newsletters on 10/08/2014 by gleanslo.